Do you remember when I waded through botanical terminology to identify my wild rose? Well, I’ve been at it again. Earlier this week, a pretty lilac-blue flower along the side of the road caught my eye, and I wanted to know what it was. It was pretty enough to be a garden plant, but I couldn’t remember which plant it reminded me of. A friend suggested it could be brown knapweed (Centaurea jacea). I searched on GoBotany, my favorite wild plant identification tool for northeast North America, and thought that might be it. 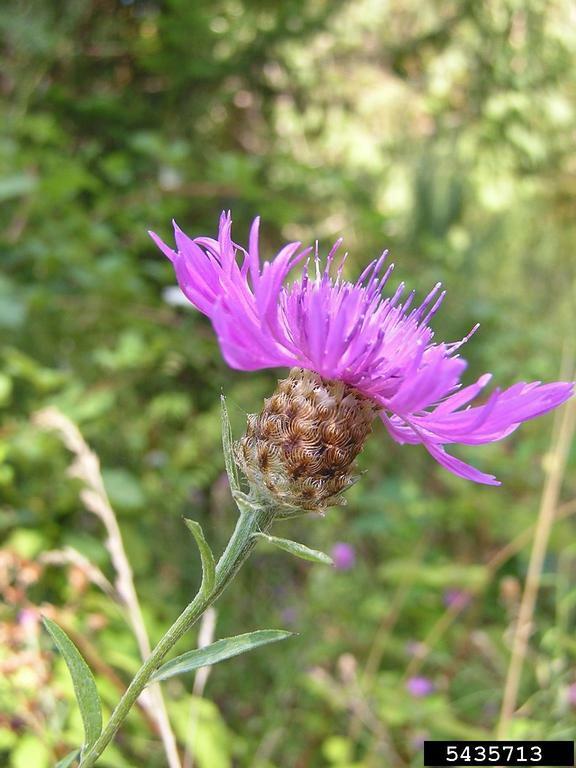 In the sidebar, it says that brown knapweed can be confused with short-fringed knapweed (Centaurea nigrescens) and black knapweed (Centaurea nigra). To tell them apart, you have to observe the appearance of the involucral bracts on the plant in question. What the heck is an involucral bract? 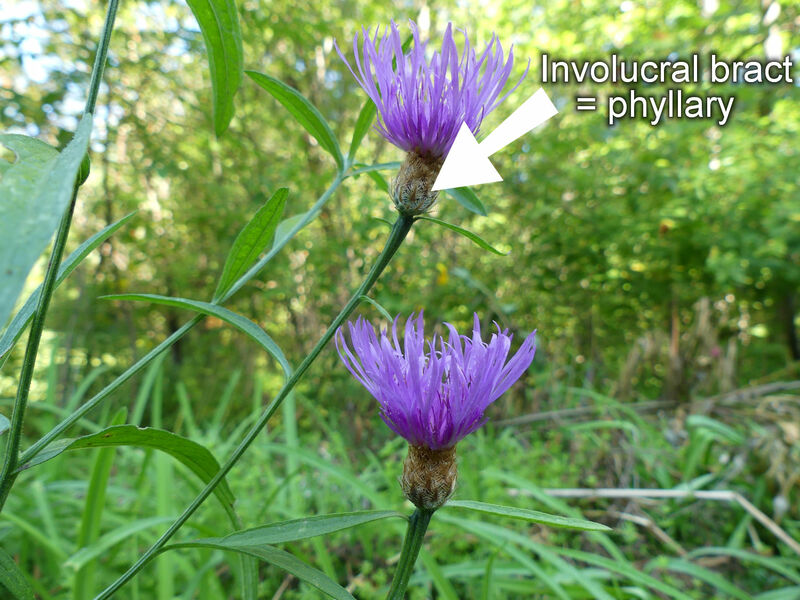 The key to distinguishing between three species of Centaurea is the appearance of the involucral bract, or phyllary. Yes, really. The only way to tell them apart is by looking at those little scale-like things on the base of the flower. There, does that clear it up for you? No? Me, neither. But it did make me realize I needed a magnifying glass to pay attention to these small differences. I don’t keep a magnifying glass at my desk, but we happen to have a pair of tweezers with a magnifying glass attached, and that was sufficient. I looked at the flower I had picked and noticed that the scales had really long–er, fringes–on them. Could those be the “apical appendages” that are “mostly 4-6mm long, with 7-15 fringe segments on each margin?” By jove, I think they are! 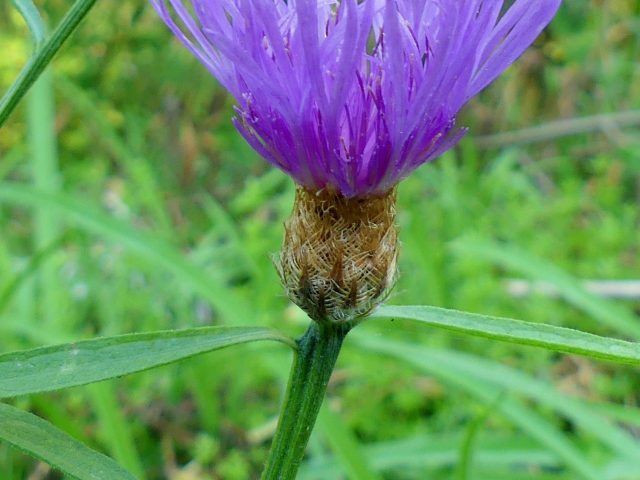 This species [black knapweed] never produces heads with enlarged ray-like, peripheral florets. And my flower most certainly does have those peripheral florets. It’s what makes it look so pretty. 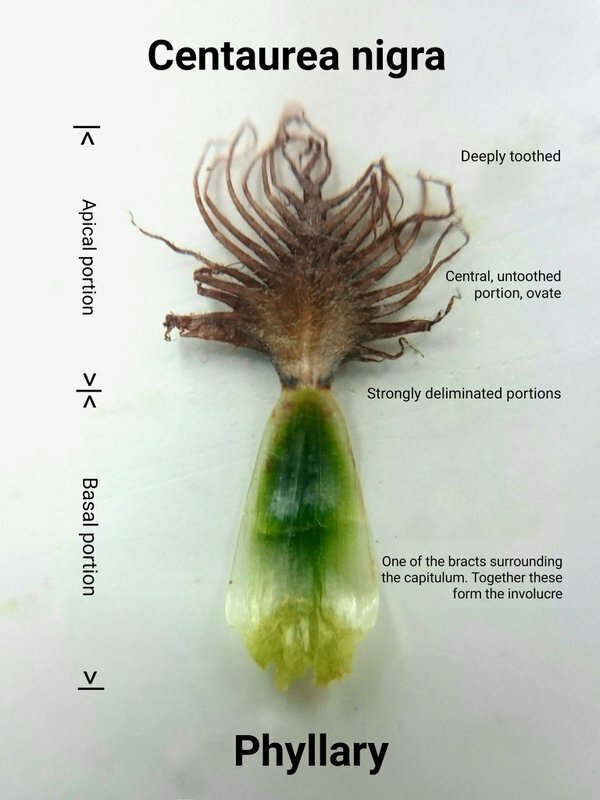 Looking back at the GoBotany description of C. nigra, I’m pretty sure “outer flowers of capitulum not enlarged” means the same thing as no “enlarged ray-like, peripheral florets.” It just wasn’t in language I could understand. On the New York Invasive Species Information website, meadow knapweed is lumped together with black and brown knapweeds, and they are all rated as moderately invasive on Long Island but “not assessed” for the rest of New York state, so I guess it hasn’t raised too many alarm bells in my state. I couldn’t find any information on faunal associations in North America, but since it’s not native to this continent, there might not be any insects or other animals that eat it. So I guess I’ll just leave it be, and enjoy it for as long as it lasts. Why go through all this trouble just to find out the botanical name of a plant? It’s pretty; isn’t that enough? Well, learning more about plants is what keeps gardening interesting for me, and I learned a lot about botanical terminology and the importance of checking all the details of a plant before deciding on its identification. Also, I’ve encountered other invasive plants growing alongside the road in the past, so it was important to me to know how this plant behaved, and I couldn’t research its growing pattern until I knew what it was called. At my previous home, I saw wild parsnip take over miles of our country road in the space of a couple of years. If I had pulled out the first one I saw, that might not have happened. 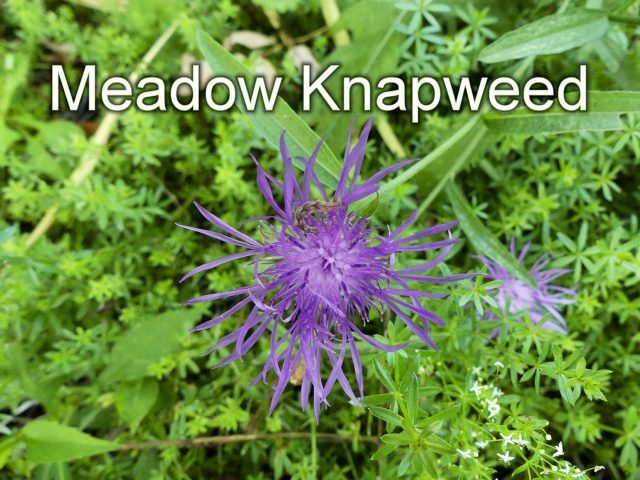 And, as it turns out, meadow knapweed is considered invasive in several western states. I will certainly keep an eye on it. Oh–that garden flower it reminded me of? Centaurea montana, known as perennial bachelor’s buttons or mountain bluet. It’s an easy plant that is often passed from one gardener to another in these parts, common as dirt. Next year when it blooms, I’ll have to check out its involucral bracts. 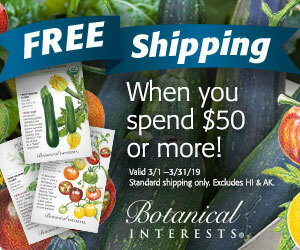 Check out Arieh Tal’s botanical photo site! He has some great information if you want to learn more about wild plants. 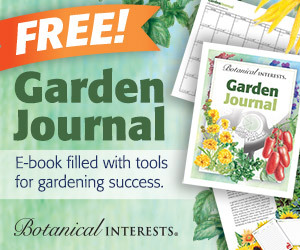 And lots of info on violets, too! Hey Kathy! You have amazing knowledge when it comes to flowers. It is a useful article, thanks for sharing. KaI thy, I’m way behind reading blog posts and have just read this one. I found it really interesting and love the way you pursued your search for a correct I.D. Wait a minute, there was a yellow blooming plant that had the structure that formed before the bloom came out of it. I don’t remember now if the perennial coneflower did. Hi Kathy, I enjoyed this post, and the comments. I won’t remember the scientific information, either, but will remember there are different kinds of centaureas. Part way through, I did a search on perennial bachelor buttons to find the botanical name, because I was pretty sure it is related to these. After that, I saw you addressed it. I don’t have mine anymore, but many years ago, when I bought it, I was surprised at the structure, you learned is involucral bract, or phyllary, that formed before the bloom popped out. Fabulous bit of plant information…I love the detailed bits and pieces you provide to explain the plant world (the photos you included are stunning). I applaud your personal edification regarding this wildflower. I have learned several new terms which I will probably forget but still, ‘involucral bracts’ rolls right off the tongue while ‘pectinate fringed’ sounds like a new style of bangs. It is a pretty thing. I have not seen it here in RI. Not enough coffee yet for me to decipher some of those words – this is in english right? Ha ha. I admire your persistence! I have the common as dirt Centaurea montana but I do believe I may have come across some other type of knapweed at the lake. I haven’t quite gotten that far at the lake where I’m looking deeply into the plant life – just skimming it for now for there is so much. Besides if I keep reading your blog, I’ll have all the information I need! How fun for you to arrive at a definitive answer! Kathy, I understand exactly where you’re coming from! Quite a few years ago, back when I first began blogging, I developed an almost obsessive interest photographing in knowing the names of all the wild flowers I came across. Knapweed was one I found and named using the Connecticut Botanic Gardens website. It’s a great source for wildflower research. You’re right, it is a very pretty flower. I thoroughly enjoyed reading about your knapweed research adventure. Well done, and thanks for sharing! 🙂 Another wildflower I love is “Ragged Robin”. Can’t remember the proper name for it. I’m sure you’ve seen it. It’s a bit similar to knapweed actually. Lychnis flos-cuculi. Blooms in the spring. Knatweed is invasive in hay fields and lawns. The roots kill grass roots around the plant and is a problem in hay fields in the York, Maine area. We now have some plants in our lawn- pretty but not nice.